He would stare at the boat. The banana boat of his dreams that slipped beyond the horizon every month. The ship the kid hoped one day would take him to opportunity. Then, finally, in 1940, the Ecuadorian dreamer, Pancho Segura, was on board – sailing to Miami. Never mind that he didn’t speak English and his wallet was all but empty. Long before players like Agassi, Seles, Kournikova, Sharapova and a couple of girls named Venus and Serena made emergence stories a core narrative of a preppy sport, the son of the groundskeeper at Ecuador’s most elite country club made his mark on tennis. The boy, who was born on a barge, and almost died in childbirth, grew up in a sugar cane house with an earthen floor and who suffered from rickets, malaria, polio and hernias, proved that you didn’t have to be an proper Anglo, an Aussie, a Frenchman or a Swede to make it in tennis. 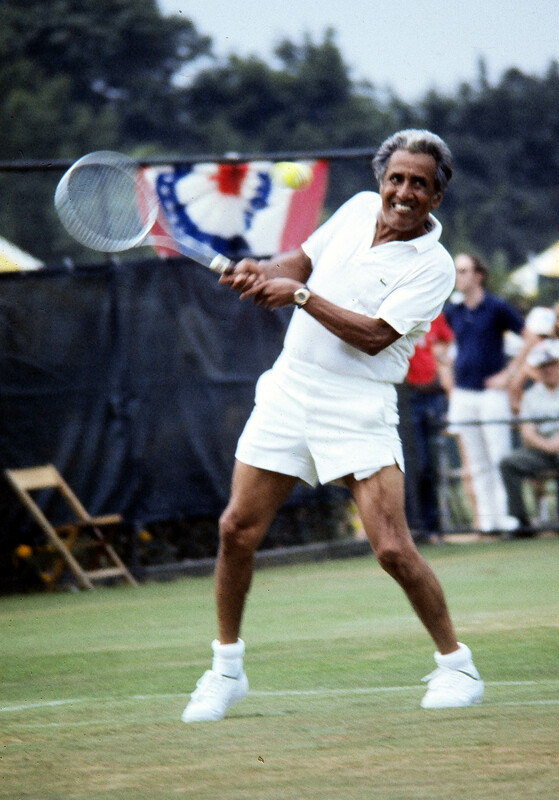 Long before a white game was integrated by pioneers named Althea and Arthur, Pancho’s gleaming brown tone and his flash of abundant hair stood out on courts and sports pages around the world. Before Seles used her unpredictable two-handed forehand to become the No. 1 player in the world, Segura’s double-fisted forehand baffled foes as much as it delighted fans. Along with Don Budge’s backhand and the serves of Jack Kramer and Pancho Gonzales, it was considered the most feared stroke of his era. In the early days of the nomadic (“Which way to Topeka?”) pro tour, top players made good money. But to the Latin kid, $300 a night was enough. Sure, tennis fans came to see Kramer, Rod Laver, Bobby Riggs and Tony Trabert. But whether it was in Madison Square Garden or a drafty gym in Moline, they left loving the passionate Segura, who lit up the place. Forehand flashing, his intent clear, he played with a Rafa-like passion that thrilled crowds. Segura scurried – a furious frenzy. His lobs dipped mean. Long before the flashy charisma of Nastase, Connors and Agassi help earned them fortunes, Segura’s sizzling charm offensives drew legions of admirers. His smiles beamed, his [“I’m seeded No. 3 at Forest Lawn Cemetary”] jokes drew chuckles. Segura may have started as a bow-legged ballboy, but he went straight to the top. He had a salty mouth that lifted profanity into a lively take-cover art form. I got into an elevator with him at the Carson Tennis Center. It went up just one floor. I bet myself that before the elevator doors opened Pancho would deliver some spicy comments. I won. There were few greater masters of the game. Long before network cameras scoured the stands for celebrities dropping in on tennis, Segura was a CBS staple. It wasn’t a US Open if announcer Pat Summerall didn’t gush about Segoo. But handsome Pancho, who was the only player to win the US Pro Championships three times, and win both the US Indoor and Clay Court titles – was no mere pretty face. He knew the game, he breathed the game. No matter how baffling, he mastered its every nuance – there were few better tacticians. He read the game with an insightful brilliance. A tennis conversation with Segoo was nothing less than a revelation. In one context or another, for seven decades Pancho excelled and touched the lives of so many. He emerged out of the University of Miami, where he won the NCAAs three times. In his era, he was considered to be well within the top 10 – say, just behind the very elite like Kramer, Budge, Gonzales, Laver and Vines. Few had more glamorous careers as teaching pros. In the early ’60s he taught at the Beverly Hills Tennis Club and then went on to reign at the La Costa Resort in Carlsbad. Not only were Moses (Charlton Heston,) and a President (Ronald Reagan) his students, so were Babs (Barbra Streisand) and Bacall, as well as Katherine Hepburn, Ava Gardner, Doris Day and Dinah Shore. He played with sheiks and, for a while, a pirate (Errol Flynn) would send a car for him every day.